Corporate & Tax Archives - General Counsel Law. This post was originally published in February, 2014. We’re re-posting in case you missed it. Determining the Appropriate Business Entity–Should I Form an LLC or a Corporation? Every potential business owner and service provider should give serious consideration to forming a business entity when they start a business to limit his/her individual liability for the debts and other obligations of his/her business. Having a separate business organization, such as a corporation or limited liability company, may allow you to separate your personal assets from those of your business—and thus protect your personal assets from certain claims against your business. To achieve this liability protection, you must organize and register your business entity with a State or the District of Columbia when you start a business. You will have a range of entity types to choose from. As a practical matter, however, most new businesses are being formed either as a limited liability company or a corporation. Tax considerations for when you start a business. The choice between the two depends on (1) the tax treatment you want for the entity, and (2) the desired ownership structure and management of the entity. Liability protection comes with a choice of tax treatments for the business. For income tax purposes, your business entity will be taxed in one of three ways: disregarded, as a flow thru entity, or as a corporation. If the entity is disregarded for tax purposes or treated as a flow thru, then the entity itself does not pay tax on its income. Instead, the business owner(s) is/are personally taxed on all of the entity’s income. If the entity is treated as a corporation for tax purposes, then the entity will pay income tax on its earnings. This type of entity is often referred to as a “C-corp.” If the owners of a corporation receive dividends, they also pay individual income tax on those dividends. Currently in most cases at a reduced 20% rate. Such double-taxation of income earned by a corporation can be costly, although that cost may be offset by deductions available only to corporations. Corporations that meet certain requirements may elect to have S-corporation status, which eliminates the double-taxation issue by allocating the S-corporation’s income and tax liability to its individual owners. In addition, use of an S-Corporation status may, under the right circumstances, limit your payroll taxes. However, S-corporation status brings with it significant restrictions on the structure and ownership of the business entity and eliminates many of the deductions available to C-corps. The choice of tax treatment is an important financial and tax decision, and best made in consultation with a qualified tax attorney when you start a business. The chart on the following pages summarizes the tax treatment available for a given entity type. Note that while a corporation may be treated as a C-corporation or S-corporation for tax purposes, a limited liability company with two or more members may choose to be taxed as either a corporation or as a flow through entity. And if otherwise eligible, a limited liability company that chooses to be taxed as a corporation may also elect to be taxed as an S-corporation. Accordingly, when you start a business as a LLC you should consult a tax professional for help in determining the appropriate tax status for your new business. Separately, when you start a business, you should consider how you are going to organize the management of your business. Corporations have a predictable management structure: its shareholders elect a Board of Directors, who in turn appoint the officers of the corporation, and the officers carry out the corporation’s day-to-day business operations. When you start a business in a C-corporation, different shareholders may have different voting and dividend rights. When you start a business in an S-corporation, all shareholders must have identical dividend rights and those who have voting rights must have the same voting rights. Shareholders in a corporation should enter into a shareholders’ agreement that provides for things such as how they will vote or limitations on the transfer of their shares. Limited liability companies, on the other hand, can have wide-ranging management structures. Such companies may be managed by all of its owners or by one or more managers, who generally are not required to be owners. All of the operations of a limited liability company are governed by the company’s operating agreement and the applicable state limited liability company rules. Because the operating agreement is so important, it is imperative to put it in writing, even for a limited liability company with only one member. The operating agreement will both lay out the day-to-day decision making procedures for the company and the rules for the interaction of the company’s members. Such rules typically include restrictions on the transfer of membership interests and provisions for distribution to members. The operating agreement should be signed by all of the members, as well as the limited liability company. The predictability of the corporate management structure can be attractive to outside investors because it does not present the risk that they will be confused by the quirks of a limited liability operating agreement. However, the flexibility of the limited liability company’s management structure enables business owners to exercise effective control over the management of their businesses. The attorneys at General Counsel, P.C. can help you evaluate the pros-and-cons of both possibilities and enable you to make an informed decision when you start a business. When you start a business, the name of your business can be critically important in attracting customers. But thinking of a great name is only the first step in a surprisingly complex process for registering the name that the public will know your business as. The first step is the name of your business entity itself. The entity cannot have the same name as another business in the state in which it is organized. The staff at the Maryland State Department of Assessments and Taxation, Virginia State Corporation Commission or DC Department of Consumer and Regulatory Affairs will be able to tell you whether the name that you are considering is available. If it is, you may register the entity immediately when you start a business or, alternatively, request that the state or District reserve the name for you for several months. If you always use the full name of your business entity when you market your business to the public, then your registration requirements stop with the business entity. However, if you use a different name, then you must register that as a trade name. (Similarly, if you are sole proprietors but do business under a different name, then you must register that other name as a trade name.) When you start a business in Virginia, you must register the trade name in each county or city in which your entity does business, and you must also register the trade name with the Virginia State Corporation Commission. When you start a business in Maryland and the District of Columbia, a single registration with the state or District government is sufficient. If you want trademark rights to attach to your business’s name, then you must take additional steps. Trademark rights for a name are based on the use of that name in commerce, not on the name’s registration with state agency that governs business entities. You can improve your claim to trademark rights by registering the name with the United States Patent and Trademark Office. The Intellectual Property practice group at General Counsel, P.C. can help you make that filing and preserve the valuable trademark rights to the name that you created. Shouldn’t I Have a Delaware Corporation or Limited Liability Company? All fifty states and the District of Columbia authorize the organization of corporations and limited liability companies when you start a business. You can have a particular state issue the charter for your business entity even if you do not conduct business in that state or have any connection with that state. This concept is most famously demonstrated with the Delaware Corporation, where many Fortune 500 corporations are chartered in Delaware even though their business operations are in other states. This occurs because a business entity’s internal relationships (corporate shareholders-board of directors; LLC member-LLC manager) are governed by the law of the state in which the business entity is organized and registered when you start a business. Delaware corporate law is generally considered to be favorable to corporate management. Delaware also has a very well developed body of case law regarding business and an easily accessible Chancery Court for resolving commercial disputes. For these reasons, publicly traded companies (and many private companies) frequently choose to organize under Delaware law. For the vast majority of businesses, the choice of the state of organization when they start a business does not have any real impact on its tax liability in the states where the company does business. Thus you are highly unlikely to avoid paying corporate income taxes to, for example, Virginia, on income generated there just because you organized your corporation under the laws of another state. Most new businesses are best served by organizing as an entity under the law of the state in which most of the business operations will occur. In the Washington, D.C. metropolitan area, Virginia, Maryland, and D.C. law vary in their requirements for corporations and limited liability companies. Although, none of the differences are significant enough to justify the extra expense of organizing an entity in a state where you are not conducting business. When you start a business you must register your business entity in every state in which it “does business.” This simple phrase belies some complex analysis. If your business has employees in a state other than the state in which the business entity is organized—even if it’s an employee who frequently travels into the state on sales calls—or if your business does more than occasional business in another state, then the business entity may need to register as a “foreign entity” in that other state. If your business only infrequently provides a service in another state, then it may not need to register in that other state. If you are unsure where your business falls, you should consult one of the business attorneys at General Counsel, PC. A business entity must appoint an official agent in every state or District in which it is registered and/or doing business. The official title of these agents varies by state (most often they are called a “Registered Agent” or “Resident Agent”), and the laws of the different states’ provide different duties and responsibility to the agents. In all states, when a business entity is sued the legal papers for the lawsuit may be served on its registered agent. In many states, including Virginia, the agent is also the recipient of all of the official correspondence to the business entity, such as annual renewal paperwork from the state. Business owners frequently appoint law firms and other specialist businesses to serve as their agent. General Counsel, P.C. serves as a Virginia registered agent for a number of business entities. In addition, a business owner generally may serve as his or her business entity’s agent in the state in which that owner resides. Before you begin making decisions about your business, you should organize and formulate your thoughts and objectives by creating a business plan. It does not need to be a formal document, especially in its early stages of when you start a business. A business plan is a living document—you will modify it frequently as you go along. When you discuss your business idea with advisors, such as an attorney or accountant, the business plan will help them tailor their advice to your precise concept, product or services. Further, when you discuss your business idea with potential lenders or investors, the business plan will provide a take-home piece that demonstrates the viability of your concept. Commercial lenders, including banks, generally will not consider lending to your business if you do not have a well drafted written business plan. I. Executive Summary: This is a one to two page summary of core ideas for a business plan. The summary should interest a reader in the business concept, product or services and entice him/her to read the entire plan. Even though here, the Executive Summary appears first in the final document, it will typically be written last. II. Description of Business and Management: This section should give a brief description of your business. Include the name of the business, how it is organized, the identity of the owners, and the history of the business. III. Description of Product or Service: It is critical to give a clear and concise description of the services to be offered by your business. This section should be written in layperson terms—technical information can be attached in the appendix. You should emphasize the benefit your product or services offer to the target market. IV. Marketing Plan: The marketing plan should include a review of industry conditions, a precise definition of your target market(s), an analysis of competitor advantages and weaknesses and a plan for promoting and selling your services. A. Industry: Describe the state of affairs within your industry segment. B. Customer: In this section, write a clear description of your target market and include their needs and wants. Your service should offer a solution to the target market or provide a benefit to your customer. C. Competition: This section identifies competitors providing the same or similar solution to your target market. For each competitor, you should define strengths and weaknesses and define how you will position your business in the market with the established firms. Do not assume that you have NO competitors. Somehow, someway, your target market is using a service that meets the need you aim to satisfy. D. Advertising and Promotion: In this section you should define how you intend to get your service to your target market. This includes marketing avenues—advertising, promotions, public relations—and distribution channels. E. Location: Describe the location of your business and how its features impact your business. If the business requires special zoning or building improvements, note them here. V. Subcontractors: If you depend on subcontractors to deliver a service, you should know how to contact these sources. In this section you will list your critical subcontractors. VI. Management Capabilities: It is important to know what resources you have in-house to support business development and growth and what resources you will need to find. In this section, you should demonstrate that your management team has technical abilities, marketing abilities and business acumen to succeed. In addition, identify directors and advisors who you will consult with. VII. Financial Plan: This section should include past financials and future projections based on sound and reasonable assumptions. If the business plan is being presented for financing, the source and use of funds should be defined here. No Obligation Consultation: If you would like to arrange a no obligation consultation to discuss your business goals and appropriate entity for your business feel free to call Norman L. Eule, Esq., Chair of General Counsel P.C.’s Corporate and Tax Group at 703-556-0411, or e-mail him at neule@gcpc.com. *The foregoing is not intended to provide, nor should it be relied upon for, legal advice. Nor is it intended to establish an attorney-client relationship with General Counsel, PC. General Counsel, P.C. – Every Business Needs a General Counsel: Led by Norman Eule, General Counsel’s Business and Tax Practice Group has over 40 years of professional experience in counseling business owners on all aspects of commercial transactions. Our attorneys have extensive experience representing a wide range of local, regional, and national companies and business ventures. If you have any questions regarding the effect of the new solicitation rules on your company, or any other business law related questions, please contact either Norman L. Eule or Robert Lee. We are proud to announce that our firm has joined IR Global as the exclusive member for Employment Law in Virginia (corporate). Our founder, Merritt Green, and General Counsel Law P.C., have a distinguished reputation in employment matters for commercial, non-profit and government contracting entities. We look forward to our new status with IR Global, and are available to help your business with our wide variety of legal expertise. Happy New Year. A new year is a good time to review and update human resources / employment policies and procedures. Provided below are eight (8) topics that all employers should review. Review and Plan: Most employers understand that HR problems can derail a business operation. Accordingly, business owners/managers should conduct a review of 2018 HR issues/problems and develop a plan for successful 2019 HR management. Review/Update Employee Handbook and other Employment Documents: Employment laws are constantly changing. Your business is changing. If you have not reviewed and updated your Employee Handbook, job application, offer letters and other employment-related documents in the past few years, they are likely out of date (and potentially legally insufficient or illegal). Conduct Harassment Training and Ensure all Employees have Acknowledged Receipt of Policy: The U. S. Supreme Court has provided employers an affirmative defense to harassment/discrimination charges (in certain circumstances) if an employer has a proper anti-harassment/non-discrimination policy in place, that has been effectively communicated to employees, and the complaining employee has not utilized such procedures. Accordingly, all employers need to: (a) ensure that they have well drafted harassment/non-discrimination policy; (b) make sure employees sign receipt that they have received such policy; (c) provide training to all employees and managers about such policy. This should be done annually and for all new employees. Review/Update/Implement Confidentiality and Non-Competition Agreement: Your business trains employees, introduces them to your clients and vendors, provides them access to your technology and trade secrets, if your business does not have a Confidentiality/Non-Compete Agreement in place, it should. Further, if you have an existing Non-Compete Agreement in place, unless drafted by an attorney and reviewed/updated in past few years, it could be outdated and unenforceable. A good agreement should: (a) protect Confidential Information/Trade Secrets; (b) provide intellectual property rights for employer through “work for hire” provisions; (c) prohibit former employee from recruiting your employees/contractors; (d) prohibit former employee from soliciting clients/prospective clients; and (e) depending on your business, prohibit your former employee from competing with your business on limited (duration and geography) basis. Review Employee/Contractor & Exempt/Non-Exempt Classifications: First, make sure you have employees and independent contractors properly identified. If your business controls the when, where and how of the relationship, the person is likely an employee and, as such, must be paid on W-2 basis. If person has their own business, works for multiple companies, has his/her own equipment, carries business insurance, has website, he/she is likely independent contractor and can be paid on 1099 basis. If any confusion, ask your attorney. Second, the Fair Labor Standards Act (“FLSA”) defines exempt and non-exempt employee categories. Exempt employees do not need to be paid overtime for work over 40 years in a week. If you have not done so in past year (with a knowledgeable attorney or HR professional), review all employment positions and ensure that employees are properly classified. Finally, make sure your business understands the FLSA rules with regard to payment obligations. Review/Update Performance Evaluation Process: Effective HR management generally leads to hard-working employees striving to help their employer grow and succeed. Without an effective performance evaluation process (“PEP”), employees are often confused, frustrated and unsatisfied. Further, and from a legal perspective, without an effective PEP, an employer may not have a documented paper trail to substantiate employment termination decisions when faced with a discrimination charge. Accordingly, at a minimum, all employees should undergo formal PEP on an annual basis (it is recommended that there also be semi-annual mini-PEP). Further, any time employees make mistakes or are reprimanded, there should be formal documentation of such actions. When an employer has effective communication with employees through PEP and documentation of any mistakes/reprimands, not only are employees more likely to succeed, but also, if such employee needs to be terminated, the employer has strong evidence supporting the employment termination decision. Fire Problem Employee(s): You likely have heard the express “hire slow, fire fast.” It is true. Unfortunately, too often employers don’t want to fire problem employees for a myriad of reasons. And, too often such problem employees are not only putting a tremendous operational drain on the business, but also they are the employee who is likely to file a discrimination lawsuit when finally fired. So, resolve in 2019 to fire (as soon as possible) your problem employees. Make sure you have documentation and substantiation for termination decision. Fire them. It is amazing how often times after a problem employee is terminated there is general improvement in morale and productivity in a business. Make Sure Your Business Has A Good Employment Law Attorney: Finally, when your business is getting ready to make an employment-related decision, whether hiring, granting leave, or a termination decision, you should not make the decision without legal counsel. You should have a good employment law attorney you can call to make sure that you are not missing any landmines. Merritt Green and Amy Muhlendorf with General Counsel, P.C. both have over twenty years of experience helping employers and would be pleased to assist. 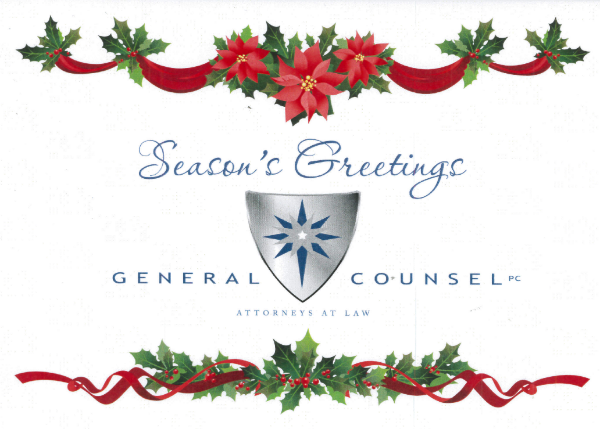 Happy Holidays from General Counsel, P.C.! Today, December 13th, General Counsel, P.C. (“GCPC”) celebrates our 14th Anniversary. This would not be possible without the trust, support and loyalty of our clients and friends. Thank you. This anniversary (and, hopefully, many more to come), would also not be possible without GCPC’s attorneys and administrative team. As a law firm, our service to our clients and success as a business would not be possible without the commitment and support of our team. During 14 years of business, certain employee turnover is expected. But, in the past few years, GCPC has built a strong (and stable) core of attorneys and firm management. Elizabeth Hart, our irreplaceable office manager, has been with the firm for almost 6 years. Andy Baxter, who leads our litigation practice, has been with the firm for over 4 years. Richard Trimber, who leads our corporate practice, has been with the firm for almost 4 years. And, Hailey Render, one of our accomplished associates, has worked with the firm for over 5 years (starting as summer intern while still in law school). With this strong core, we have continued to add team members. Amy Muhlendorf, who is an exceptional employment law attorney, has been with the firm for 1.5 years. Carmody Daman, who helps lead our govcon practice, has been with the firm for (almost) a year. Michael Daniels, our newest associate, in a different life, was my first legal client with his former business, Incisive Technologies, LLC (a govcon in the intelligence space). We also added a paralegal this year, Abbi Semnisky, who has been wonderful (and, even after working with lawyers for a year, still wants to attend law school). Finally, we have a few “of counsel” attorneys who are invaluable in assisting our clients. In particular, this includes Christopher Davis (litigation) and David Kaye (corporate). When I started GCPC, I was excited by rapid growth and acquisition of clients and opportunities. Now, after 14 years, I am excited about a strong team, stable growth, and the relationships we have built and continue to build with our clients and colleagues. It is an honor to provide legal services to our clients. General Counsel, P.C. would not be able to celebrate 14 years without the support and loyalty of our clients and friends. Thank you. I wish you success in your business and personal pursuits. And, if we can ever be of service, please contact us. With so many states enacting legislation permitting marijuana use in some form, new questions have developed as to employers’ rights regarding marijuana use by employees. 30 states and the District of Columbia currently permit marijuana use for medicinal purposes. Of those states that allow medicinal marijuana, 9 states and the District of Columbia also permit recreational marijuana use, in some form. With more states considering similar legislation, allowance of recreational marijuana use seems to be on the rise. However, despite support for some level of marijuana use among the majority of states, marijuana use is still prohibited under federal law. This inconsistency creates some uncertainty for employers who are unsure how to handle the issue of marijuana in the workplace. Under the federal Controlled Substances Act, marijuana is prohibited as a Schedule 1 illegal drug. The Americans with Disabilities Act (“ADA”), prohibits employers from discriminating against qualified individuals on the basis of a disability and requires employers to provide reasonable accommodations to employees with disabilities. Since medicinal marijuana is often prescribed to individuals with disabilities recognized under the ADA, a question arises regarding how medicinal marijuana use affects the protections of disabled individuals under the ADA. However, the ADA specifically excludes protection for individuals “currently engaging in the illegal use of drugs.” Such individuals are not considered “qualified individuals with disabilities” under the ADA. The Act defines “illegal use of drugs” as the use of drugs that are unlawful under the Controlled Substances Act. Since marijuana remains prohibited under the Controlled Substances Act, as a Schedule 1 substance, courts have historically found that employers are not required to provide accommodations for the use of medicinal marijuana under the ADA. D.C., Virginia, and Maryland have all taken steps towards legalizing marijuana use, in some form, but each location’s legislation varies greatly. Understanding your state’s policy on marijuana use and the related rights of employees and employers is vital to staying in compliance with changing policies. Maryland has passed legislation permitting the use of marijuana for medicinal purposes. However, this legislation does not prevent employers from testing for marijuana use and does not protect employees that test positive for any reason. Virginia has passed a very narrow medical exception to the Virginia Drug Control Act, which classifies marijuana as an illegal substance. Under the Virginia law, possession of marijuana is not legalized, but an affirmative defense is created for individuals with intractable epilepsy who meet specific medicinal marijuana requirements. Virginia does not provide any protections for prospective or current employees that use medicinal marijuana. D.C. has passed legislation permitting medicinal marijuana use, as well as recreational marijuana use for individuals over the age of 21. Current D.C. employees do not have any employment protections for medicinal or recreational marijuana use. However, under the Pre-Employment Marijuana Testing Act of 2015, employers are prohibited from testing prospective employees for marijuana prior to a conditional offer of employment. Employers are permitted to require prospective employees to take drug tests after a conditional offer of employment has been made. If you need to know more about the potential risks of violating marijuana laws in DC, or Virginia, contact an experienced criminal law attorney like Jay P. Myktiuk. It is important to note that in states that permit use of marijuana for some purpose, no state permits employees to use or be under the influence of marijuana in the workplace. Additionally, no state provides employment protections for employees or job applicants who use marijuana recreationally. However, some states offer limited employment protections for employees and job applicants who use marijuana for medicinal services. In such states, employees or job applicants who are discriminated against due to their medicinal marijuana use may have legal claims under state disability or marijuana laws. As noted above, none of the statutes in D.C., Virginia, or Maryland specifically provide workplace protections for employees using medicinal marijuana. Private employers in these states are free to set their own drug policies, including zero-tolerance, drug-free workplace policies, and to discipline or terminate an employee who violates those policies. Even in states that allow some form of marijuana use, federal contractors must still maintain zero-tolerance policies. Additionally, the Department of Transportation specifically stated that a state’s allowance of marijuana use will not be a valid explanation for a transportation employee’s positive drug test. The DOT also explained that any safety-sensitive employee subject to drug testing under the DOT’s regulations are not permitted to use marijuana, regardless of a state’s policies. Recent court decisions may point to a shift in the way courts view medicinal marijuana use. Historically, employees fired for off-duty medicinal marijuana use have lost lawsuits against their employers, because even though medicinal marijuana may be legal under state law, marijuana is still illegal under federal law. However, recent cases have disagreed. In 2017, a Rhode Island court found that an employer couldn’t refuse to hire an individual because of her status as a medical marijuana cardholder and use of medicinal marijuana outside of work. Again in 2017, a Massachusetts court found that a medical marijuana user who was fired for failing a drug test could proceed with her discrimination claim. The court found that although illegal federally, the state’s disability discrimination law permitted employees a right to seek a reasonable accommodation for medicinal marijuana use. Continuing the trend, in 2018 a Connecticut court found that an employer discriminated against a job applicant and violated Connecticut’s medical marijuana law when it refused to hire a medical marijuana user after she tested positive on a pre-employment drug test. Courts in D.C., Maryland, and Virginia have not yet addressed the issue. However, these court cases show the importance of staying up to date with court decisions depicting how courts view issues regarding termination of employees who use medicinal marijuana. Continue to monitor changes regarding the use of marijuana in state and federal legislation, as well as court opinions. Since the law is still evolving, the uncertainty around marijuana in the workplace can make setting workplace policies difficult. General Counsel PC can help you examine the nature of your workplace to determine the best policies for your specific business. Our attorneys are specialized in labor and employment law and have experience working with business owners across Maryland, Virginia, and D.C. Call General Counsel PC at 703-556-0411 today to see how we can help you. The National Labor Relations Act (“NLRA”) serves to protect the rights of employees and employers while restricting certain management practices that may harm workers. The National Labor Relations Board (“NLRB”) is the federal agency that enforces the NLRA. Section 7 of the NLRA protects an employee’s right to engage in concerted activity, organize, and bargain collectively. Section 8 prohibits employers from adopting workplace policies that interfere with, restrain, or coerce employees in their exercise of these Section 7 rights. Until recently, the NLRB analyzed employer policies under a “reasonable construction” standard created in Lutheran Heritage Village-Livonia, which asked whether employees could “reasonably construe” that an employer policy prohibited a Section 7 right (known as the Lutheran Heritage standard). This standard was very unclear and often led to arbitrary results, leaving much confusion about what rules were actually prohibited under the NLRA. Recently, in The Boeing Company, the NLRB abandoned this approach and adopted a new standard, allowing the NLRB to consider unique characteristics of a particular situation, rather than the previous “one-size-fits-all” analysis. 365 NLRB No. 154 (Dec. 14, 2017). Under the new rule, the NLRB will first determine whether a facially neutral policy, when reasonably interpreted, could prohibit or interfere with the exercise of an NLRA right. If not, the rule is lawful, without consideration of business justifications. However, if the NLRB finds that a policy may interfere with Section 7 rights, the NLRB will now analyze two factors: (1) the nature and extent of the potential impact on NLRA rights; and (2) legitimate justifications associated with the requirements. In making this evaluation, the NLRB will work to “strike the proper balance” between “asserted business justifications and the invasion of employee rights” under the NLRA. Category 1 includes rules the NLRB designates as lawful to maintain, either because they aren’t interpreted to interfere with an employee’s NLRA rights or because any potential impact on these employee rights are outweighed by employer justifications for the rule. (i.e. rules that are lawful, because any impact on an NLRA right is outweighed by the employer’s reasoning for the rule). Category 2 includes rules that warrant individualized scrutiny to determine if the policy would interfere with an employee’s NLRA rights, and if so, whether the potential impact on these rights is outweighed by legitimate employer justifications. The NLRB explained that in making its determination, it may differentiate among different types of NLRA protected rights, as well as substantial, rather than peripheral, employer justifications. The NLRB also noted that it may apply distinctions between different industries and work settings, as well as consider particular events that may be relevant to the purposes served by a specific policy. The NLRB will weigh a policy’s potential impact on protected NLRA activity against the employer’s legitimate business justifications for the policy. If the policy’s justifications outweigh the potential impact of employee rights, the rule is lawful. If employer justifications don’t outweigh the impact on employee rights, the policy is unlawful. This new approach is more favorable to employers since it offers greater consideration of employer justifications for rules. Additionally, employers and employees will have more confidence about the validity of policies, since the new standard provides greater clarity and certainty regarding whether, and to what extent, different types of rules are lawful. Even though the NLRB’s new approach offers more security to employers, it is still important for employers to review their employee handbooks and other workplace policies to ensure they all comply with the NLRA. Attorneys at General Counsel PC are specialized in labor and employment law and have experience working with business owners and individuals across Virginia, specifically in Fairfax County, Arlington, Loudoun County, and Prince William. Our attorneys will stay informed of subsequent NLRB decisions offering additional guidance on the new approach, to ensure we can provide clients with the most up to date information. Call General Counsel PC at 703-556-0411 today to see how we can help you. A recent U.S. Supreme Court case, Epic Systems Corporation v. Lewis upheld employers’ use of class-action waivers in arbitration agreements. No. 16-285, 2018 WL 2292444, at *1 (U.S. May 21, 2018). Based on this ruling, employees that have signed such agreements are no longer able to join together to sue employers and instead must use arbitration to individually resolve any issues. This decision will likely make it harder for employees to sue employers now that collective bargaining is off the table. Class actions offered employees a chance to seek damages from employers when individual lawsuits were too costly, potential damages were too low, or when employees feared retaliation if they sued employers individually. Epic Systems Corp. consolidated three separate cases involving three different employers: Epic Systems, Ernst & Young, and Murphy Oil. In each of these cases, an employer and employee entered into a contract providing for individualized arbitration proceedings to resolve employment disputes between the parties. However, each employee later sought to litigate Fair Labor Standards Act and related state law claims through class or collective actions in federal court. The Arbitration Act requires courts to enforce agreements to arbitrate, including the terms of arbitration agreed to by the parties. The Arbitration Act also includes a savings clause, which allows courts to refuse to enforce arbitration agreements “upon such grounds as exist at law or in equity for the revocation of any contract.” The employees here argued that the savings clause applied to the waivers prohibiting class actions, creating a “ground” upon which the court may refuse to enforce the arbitration agreements. The employees relied on the National Labor Relations Board’s interpretation that the National Labor Relations Act overrides the Arbitration Act. However, the court found that the savings clause was not applicable to the employees’ arbitration agreements. The court’s finding that collective bargaining law does not supersede the federal law that established the arbitration process and that the class-action waivers in employment contracts are valid, may lead more employers to include such provisions in their employment agreements. Employers are likely to see the court’s decision as a big win, while employees may second-guess decisions to initiate actions against employers, knowing arbitration is the only option. Whether you’re an employer or employee wondering how this decision might affect you, attorneys at General Counsel PC can help. Our attorneys are specialized in labor and employment law and have experience working with business owners and individuals across Virginia, specifically in Fairfax County, Arlington, Loudoun County, and Prince William. Call General Counsel PC at 703-556-0411 today to see how we can help you. What Should I Consider During a Business Divorce? Business relationships fail for many different reasons: business partners may have long-term disagreements, a change in leadership, or simply a desire to go in different directions. Even successful businesses may have to deal with business divorce issues if business partners decide that the benefits of continuing their business relationship are outweighed by the costs accompanying their continued co-ownership of the business. Breakups are never easy, and business relationships are no different, but there are some things business owners can do to help prepare themselves for the eventual divorce. Even if business partners don’t ultimately decide to part ways, some type of conflict is almost inevitable. For this reason, it is important to plan ahead and have some type of operating agreement or corporate shareholders agreement in place at the start of the business relationship to help guide the resolution of conflicts later on. A well-drafted agreement at the time of business formation can help to prevent a deadlock from occurring over disagreements about how to end the relationship. Important provisions to consider including in these formation agreements include buy-sell agreements, provisions to forestall squeeze-outs, triggers for dividends, and non-compete agreements. A buy-sell agreement requires the company or remaining majority owners to purchase the minority’s stock in the case of agreed upon events. To ensure that a deadlock isn’t reached, an agreement can include a “shotgun” provision, requiring a mandatory sale in the case of disagreement and deadlock. While this ensures that the business isn’t left in limbo while business partners disagree, it also means that in the case of a disagreement over how to part ways, neither party is able to retain the business. Another option is including a provision that gives all shareholders the right to offer a specific price per share for the other shareholder’s shares. The other shareholder then has the option of accepting the offer or buying the offering shareholder’s shares at the agreed-upon price. What Are My Options During a Business Divorce? Many business disputes arise when there is a deadlock between the owners and the owners’ inability to agree results in the business being unable to make business decisions. There are a few different ways to deal with such deadlocks and a resulting business divorce. One option is to appoint a provisional director which serves on a corporation’s board of directors until a deadlock is broken. Another option is a buyout, where majority owners purchase minority owner’s remaining stock. Business owners can also consider complete dissolution of the company, selling all of the company’s assets and parting ways. Additionally, business partners may want to use mediation to allow a neutral third party to help resolve business disputes. If none of these alternatives are able to generate a resolution, parties can seek legal remedies in court, but that option is often costly, time-consuming, and not usually preferable. Even if it’s certain that a business will soon be dissolved, business owners must use caution to ensure they do not take any actions against the company in bad faith. Until the time when a dissolution is official, business owners may owe a fiduciary duty to the company, as well as to each other. If one co-owner plans on leaving the business to start his own competing business, he may be in violation of non-competition or non-solicitation agreements. The specific duties owed to the company and other business owners vary depending on the type of business entity involved. For example, under the Virginia Uniform Partnership Act, partners owe the partnership and other partners a duty of loyalty and care. Under the Virginia Code, partners also must act in accordance with the obligation of good faith and fair dealing. These duties do not end until the partnership has dissolved, so partners must refrain from competing with the partnership and other partners before the dissolution is complete. Additionally, business owners using company resources for their new businesses or asking clients to leave the business and instead go to the new business may face liability for tortious interference with contract expectancy, civil and statutory conspiracy, as well as other claims. A claim for statutory business conspiracy under the Virginia Code may be made if another owner suffers injury to his “reputation, trade, business or profession.” A claim for tortious interference with contract expectancy may be successful if a co-owner intentionally interferes with a business relationship or contract expectancy of the company’s and the interference results in a breach or termination of the relationship or expectancy. Disengaging from a business relationship is a complicated matter. Having to decide what the best course of action is and not knowing what you can and can’t do just adds to an already stressful and difficult situation. Seeking help from experienced professionals who can help guide you throughout the process will help lessen the burden and make the process run more smoothly. Our attorneys are specialized in business law and have experience working with business owners across Virginia, specifically in Fairfax County, Arlington, Loudoun County, and Prince William County. Call General Counsel P.C. at 703-556-0411 today to see how we can help you.